Dan is a naughty Dalmatian who spends ALL of his time eating cookies. In fact, he’s so busy eating cookies, he has no time to help the fire fighters when they need him. Will Dan ever learn the importance of helping others? 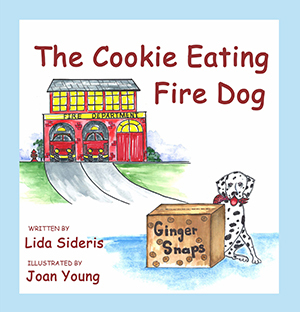 Lida Sideris loves baking and eating all kinds of cookies. Never, ever leave her alone with a batch of fresh baked cookies…if you want any left for yourself. She is the author of the Southern California Mystery series. This is her first book for children. When she’s not writing, she’s running a legal non-profit in Southern California. Lida is a lawyer and mother of two human and two canine kids. She is an avid supporter of the three R’s: reading, writing and rescue dogs.